Films based on video games haven’t exactly been well received in the past, but ‘Assassin’s Creed’ seemed to have more promise based on a strong cast and a reteaming of ‘Macbeth’ director Justin Kurzel with his leads from that film, Michael Fassbender and Marion Cotillard. Australian director Kurzel’s work on ‘Macbeth’ was visually striking and brought something new to material that had been adapted many times previously, so on that basis he seemed a good match for ‘Assassin’s Creed’ given its premise. Unfortunately ‘Assassin’s Creed’ is frankly a rubbish movie that still manages to feel overstuffed despite a thin story and plot, and once again, it’s another attempt to adapt a video game that only serves to emphasise why it belongs in that format in the first place. The film centres around Callum Lynch (Michael Fassbender), a criminal who is due to be executed when he is rescued by a mysterious organisation led by Jeremy Irons (whose mere presence tells you this organisation may not be entirely clean) who have a different purpose in mind for the man. That purpose is to locate the ‘Apple of Eden’ through a programme known as the Animus Project, which will see Callum connected to a machine that will allow him to relive the genetic memories of one of his ancestors. That man is Aguilar de Nerha, a member of the Assassin’s Brotherhood, and the periods in the past take place at a time when the Assassin’s are fighting the Templar Order. It’s a convoluted opening half hour to make Dan Brown proud and the endless exposition prevents the film from getting interesting until Callum actually enters the Animus and moves into the past. The segments in the past are quite exciting at times, but even the better moments are spoilt by strange directing and editing choices, where we continually flash out of the past to see Fassbender’s movements whilst attached to the animus in the present day. It’s a distracting technique and it really takes you out of the moment, removing any chance the film had of immersing you in the historical part of its story. Given those elements are the most interesting, it’s a fatal flaw in the film’s makeup. The film isn’t a complete slog, largely down to a strong cast (beyond Cotillard and Fassbender we have Jeremy Irons, Charlotte Rampling, Brendan Gleeson and Michael K. Williams amongst others), and some fun stylistic flourishes that do take advantage of the video game origins, namely the introduction of the game’s trademark ‘leap of faith’. Disappointingly, these moments are few and far between and there’s little to separate the action sequences from any other CGI-fuelled blockbuster. 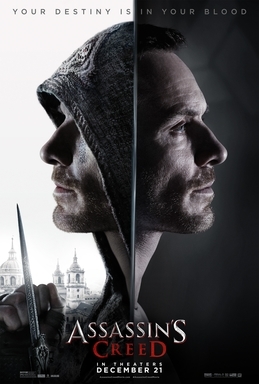 More than this, ‘Assassin’s Creed’ gives the audience very little reason for why we should care about a battle between the Assassin’s Brotherhood and the Templar Order, and despite the strong cast, no character beyond Fassbender’s Lynch are treated as anything more than stock characters. By the time the film starts to delve into the real reasons behind the Animus Project in the present day, I’d lost interest and was waiting for it to end. On the evidence of ‘Assassin’s Creed’, we’ll still be waiting a while for a good video game adaptation, but ultimately some stories are better suited to different media formats, and ‘Assassin’s Creed’ is one in a long line of properties that’s lost the excitement and vigour that made it so popular as a video game on its journey to the big screen. Hopefully the talk of sequels is just that, as I’d be disappointed to see talented people such as Kurzel and the likes of Fassbender waste more time making movies like this.